Each holiday season, three enterprising women – Alexa Boyt, Alison Ochoa and Estela Rodriguez – make sure to provide something a little special for their patrons, along with their own unique café atmosphere and five-star cups of coffee. Just in at La Taza Negra Café and Coffee Roasterie are three new specialty coffees: Organics Puebla, Nayarit and Veracruz. These, as well as boxed cookies, are great gift options. All coffees sold are roasted to perfection by Ben Boyt, Alexa’s life partner, who also provides the coffee for La Bruja and La Buena Vida Café. Hours: Monday-Friday, 8:30 a.m.-1 p.m. Closed December 24-28. Vicente Guerrero 112, Villa Obregon/Melaque, 315-355-7080. Guadalajara Reporter sold here. Just in at La Bruja Coffee Bar and Art Gallery is their Christmas special Cabañuela winter ale. Alison Ochoa is also serving seasonal specialty drinks such as Pumpkin Spiced Latte, Chocolate Latte a la Orange Essence and Spicy Chai. Gift items include holiday greeting cards, La Bruja gift certificates, gingerbread and oatmeal cookies with cranberries and other seasonal ingredients. 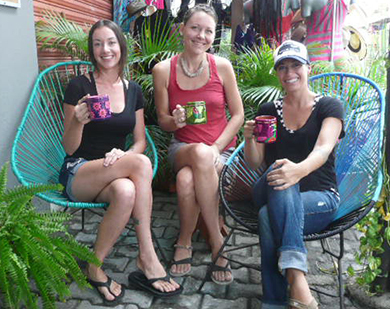 You will also find coffee makers and beans, teas, La Bruja/surfer T-shirts and hats, jewelry, artwork and surf gear. Husband and local acupuncturist, Doug Grootveld, can also be seen hanging out and helping out with local patrons. Hours: Tuesday-Saturday, 8:30 a.m.-1:30 p.m. Closed December 25-28. Av. Veracruz 230, Barra de Navidad, 044-315-104-4278. Guadalajara Reporter sold here. Estela Rodriguez of Buena Vida Café prides herself on sourcing the highest quality ingredients for her café. Customers come back for her homemade-dressings and baking, super food smoothies, fresh veggies and Indian spiced dishes. Just in is Estela’s suggestion to experience the “tao of tea” with Japanese matcha and guayaki yerba mate. “People get excited that we are offering healthy options they miss while away from home,” she says. Her partner Guil Villaseñor is there daily perfecting his coffee art and smoothie skills. Hours: Tuesday to Saturday, 9 a.m.-3 p.m. Friday and Saturday, 6-9 p.m. Miguel Lopez de Legazpi 145, Barra de Navidad malecon, 315-355-8188. 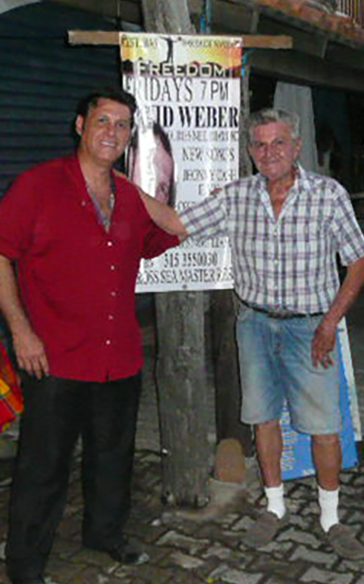 David Weber Olivares (aka “The Mexican Elvis”) performed his first song in his father’s restaurant at the age of six. “He was born with the music in him, just like his grandmother,” says Dad Pedro. Weber’s grandmother was born at a time when women were disgraced for singing in public. The opposite was true for her grandson. David got his degree in tourist business law to satisfy his father’s wishes, yet followed his true calling. With his charisma and good looks, plus an ability to sing Johnny Cash and Neil Diamond with ease, friends encouraged Weber to try out an Elvis impersonation some 20 years ago. His popularity soared and he’s never looked back. Watch Elvis perform while sampling Pedro Weber and wife Nina’s hospitality and cooking at their Freedom Restaurant Bar, Lopez de Legazpi 138, on the Barra malecon, Reservations at 355-0030. Facebook David Elvis Show Weber for his weekly schedule. He’s also just released an Xmas CD in English/Spanish. Sarah Pettigrew will be joining her father Doug, of Hermanos Rojo, Saturday, December 19, 6:30 p.m. at Sea Masters and on Thursday December 24, 2 p.m., at the Cabo Blanco Hotel. Her uncle Scott, another Hermanos Rojo musician, will play at a special dinner at Sea Masters on December 25. Carolers will participate in Barra’s Christmas parade on Sunday, December 20. The Christmas Choir will sing in the Barra Jardin on Wednesday, December 23, 7 p.m. These days many artists pack up their art supplies looking to discover workshops in stimulating locations. Nancy Lennie is such an artist who taught every grade level in art and adult painting classes before she moved in 1997 to San Patricio/Melaque to build La Paloma Oceanfront Retreat and Art Center. She continues to offer creative classes. Art History begins Mondays at 5:30-6:30 p.m., mid December. See schedule online or visit the studio to find out about the 3-5 day workshops with various artists in January. Visit: www.lapalomamexico.com.